It goes well in fruit cups with apricots, strawberries, and medlars. It also combines with cream cheese spread or you can add it to a meat sauce to eat with grilled chicken legs. The summer jam is made with berries that only grow during this precious time: strawberries, raspberries, red currants, and blueberries. We preserve the best wild berries so that you can enjoy them all year round. It pairs with fresh cheese or goat cheese, or with crepes and butter croissants for breakfast. It can be mixed with frozen yogurt or natural yogurt. The autumn fruit jam is made with mango, apple and pear; the fruits which give autumn its color and aroma. We combine the best autumn fruits to enjoy them all year round. It is ideal for making vinaigrettes for salads, like apple and pomegranate salad or chicken and toasted almond salad. It pairs with cheese like Gruyere and Brie and can be used as a base for preparing a delicious sauce to accompany duck confit, turkey, or free-range eggs. 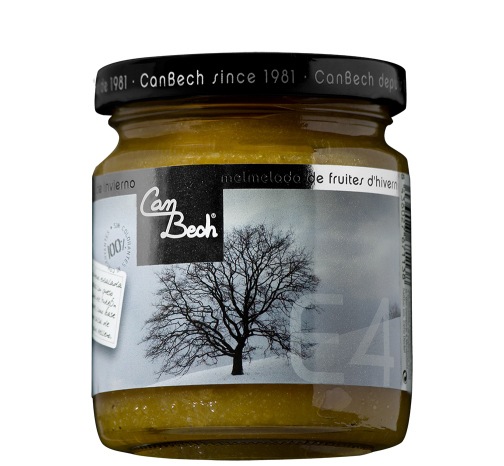 The winter jam is made with citrus fruits, the predominant fruits of the Mediterranean during this season: oranges, lemons, and limes.Ingredients: Apples, sugar, lemon juice, coffee and naturally derived pectin. This jam combines perfectly to make a vinaigrette for a pear and chestnut salad with cured cheese; or with almond nougat, macadamia nut, or mocha ice cream; or simply as a base for a meat sauce for stuffed turkey or chicken. Preserved figs, from their own harvest, are the specialty of CanBech; the jewel of the house. Whole preserved figs with a thick syrup are ideal for giving a special touch to any dish. This tomato jam is a Spanish specialty, made with ripe tomatoes from the Murcia region.We prepare this jam only during the summer, when the tomatoes are good and ripe, so that the fantastic red color can be achieved naturally. Raspberries, blackberries, blueberries, & strawberries gives the perfect tart mix. This original jam is based on apple as an agglutinator, due to its mellowness, and incorporates Colombian coffee, which completely transforms the flavor, giving it a sensorial quality that pleases everyone.This product gives the palate all the flavor and aroma tonalities of the roasted bean, allowing all those who are intolerant of the drink to have an energizing, aromatic condiment for starting the day off right. 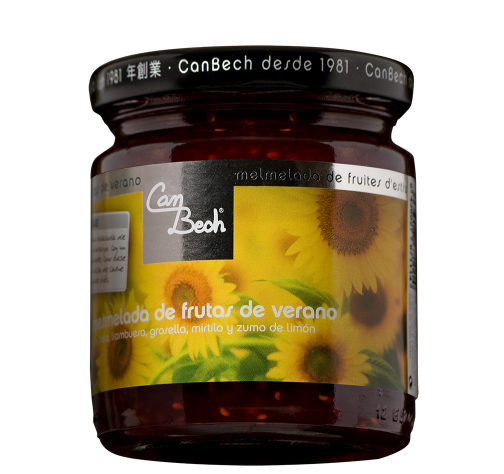 Can Bech selects the finest nuts, fruits and spices, importing them from five continents, in order to achieve the perfect flavor to accompany fresh and soft cheeses, soft ripened cheeses, washed rind cheeses, hard paste and blue cheeses.